Ars. 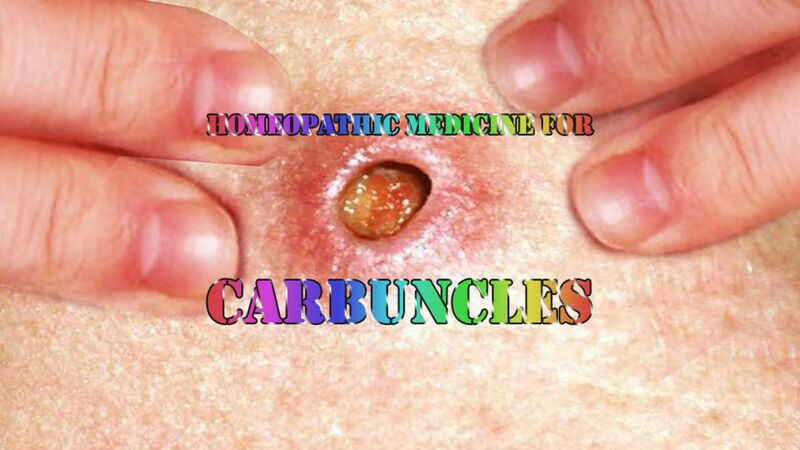 is a prominent remedy for carbuncle. Great burning in the seat of carbuncle, as if coals of fire were on the affected part. Cutting, lancinating pain, worse after mid-night and extreme restlessness. Anthracinum has precisely the same symptoms of Ars. Violent burning pain in carbuncle, not relieved by Ars. Heat, redness, throbbing pains and swelling. Carbuncle between the shoulders and nape of the neck. Indurations remaining after boils or carbuncle. Lachesis is indicated when the surrounding area is swollen and looks purple or blackish and pus form very slowly. R.T. is indicated in the beginning, when the pains are intense and the affected parts are dark red. When R.T. fails to give relief, Ars. or Anthracinum should be given. Great bluish discoloration of the carbuncle as in Lachesis. Burning fever, great thirst and anxiety. It should be given when the affected part is bluish or livid and when the discharge is offensive and associated with burning pains like Ars. but without the extreme restlessness. It is also useful when the carbuncle becomes gangrenous.